All is not well in the great Republic to the south, or so argue two of America's most distinguished political scientists, Robert Dahl and Alan Wolfe. Two recent releases, Dahl's slim volume, On Political Equality, and Wolfe's more muscular, Does American Democracy Still Work?, examine the state of the American polity and find it wanting. Though no single factor can adequately account for the sense of drift and rancour in American public life, one feature is prominent: the highly charged atmosphere of partisan politics, which Wolfe christens as "the new politics of democracy," has bruised the country's public discourse, leaving many citizens ignorant, indifferent, or deeply cynical. Dahl and Wolfe are not mere diagnosticians, however; each steers us toward what may prove to be a restorative, a tonic for what ails America's body politic. 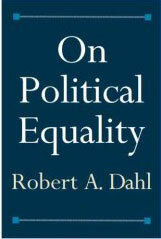 Dahl's tract on equality reads like a primer on democratic theory. Effective participation in the political process, equality in voting, adequate and independent means of understanding issues, and freedom of association are the sinews of a democratic state. These rights are necessary. Enshrined in the American Bill of Rights, they curtail any majoritarian impulse that would seek to deny these rights to some, and delimit the authority of the state. All democracies, Dahl contends, are works in progress. Concentrating as he does primarily on the United States, he contrasts the development of democracy in America with an ideal prototype. America's civil war may have helped the country atone in part for its sin of slavery, but it was not until a century later�when president Johnson spearheaded the Civil Rights Act of 1964 and the Voting Rights Act of 1965 through a reluctant Congress�that the United States was finally able to mend the fracture that had dogged the country from its inception. The 19th amendment, which gave women the right to vote, was only enacted in 1920. The mistreatment of America's aboriginal peoples, moreover�the corrosive effects of which are still being felt�is further evidence that America has never been an ideal democratic polity. Most persons, Dahl argues, have an innate sense of fairness. He cites the liberal theoretician John Rawls who, in A Theory of Justice, asks us to construct a society behind a "veil of ignorance." The aim here is to make us envision circumstances in which we divest ourselves of whatever may sway us to bias: we are barred from knowing our station in life, our class or position; nor are we to know our "fortune in the distribution of assets and liabilities, (our) intelligence, strength, and the like." Rawls believes we are thereby bound to arrive at a consensus, accepting that each person should have "an equal right to the most extensive liberty compatible with the most similar liberty for others." Formal equality and inclusiveness are fine, but what can citizens cull in their quotidian lives from this exercise in abstraction? Dahl points to structural obstacles, many of which we have little or no control over, that block the road to real equality. Among these are the constraints of time, the size of political systems, and the impact of market forces that�despite the advantages they offer in the delivery of goods and services�also produce persistent poverty and structural unemployment. Dahl also reminds us that the onset of a national crisis, such as America experienced on 9/11, siphons power away from the country's elected representatives to the executive branch. Democracies wax and wane. Dahl's thesis is that the state of a democracy's health corresponds to the conditions of equality: while a decrease in equality gnaws away at democratic foundations, an increase in equality shores them up. The widening gap between rich and poor in the United States these last few decades cannot fail to produce other inequalities. "The cumulative advantages of power, influence and authority of the more privileged strata may become so great," Dahl writes, "that even if less privileged Americans compose a majority they are simply unable, or unwilling, to make the effort it would require to overcome the forces of inequality arrayed against them." Despite this gloomy prospect, Dahl points to a certain path citizens can take which, with some effort, would help clear the underbrush on the road to greater equality. Our error, Dahl writes, consists in conflating our power of acquisition with our happiness. The pitch and ubiquity of our consumer-driven culture seduces us into thinking not only that more is better, but that more is all there is. Here greed is the engine; invidious consumption and the inculcation of envy are its by-products. "Numerous studies have shown," Dahl writes, "that once people have reached a rather modest level of consumption, further increases in income and consumption no longer produce an increase in their level of well-being and happiness." Dahl's hope is that citizens look beyond the simulacrum of happiness consumerism confers to purposeful activities outside the self. Charles Taylor, no braying critic of modernity, argues in The Ethics of Authenticity that concerns beyond the self are a necessary condition of our self-regard. If we do not heed their call, we will likely succumb to a soft despotism that will assert itself through technology, bureaucracy, and consumerism. Civic action, political engagement that would strive for�among other aims�greater equality, is one way of heeding such a call. In Does American Democracy Still Work? Alan Wolfe argues that America's culture wars have transfigured the nature of the country's politics, and not for the better. Despite early liberal successes in the kulturkampf�like the Supreme Court's 1973 decision in Roe vs. Wade, and the Senate Judiciary Committee's rejection of Robert Bork to the top bench in 1987�conservatives have been the predominant power in politics. Conservatives have successfully tapped the language of populism and moralism. Having taken to heart the Nixonian creed that winning is the one thing that matters in politics, they have proven themselves willing to shunt aside their traditional principles�fiscal and judicial restraint, among others�as the price for electoral success. 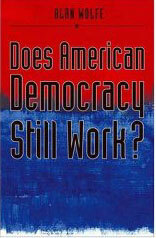 The result, Wolfe argues, is crippling democratic institutions. An informed electorate is the lifeblood of democratic life. For example, once it became clear that claims regarding Hussein's WMD program and his purported links to Al-Qaeda were unfounded, the administration resorted to a rhetorical device, known as "priming", to justify the Iraq war. The aim was to tap a core concern Americans had had about their security since 9/11. "The administration," Wolfe writes, "used a simple but dramatic narrative of crisis" as a conduit for the invasion. Priming hasn't been confined to Iraq either. On the domestic front, Bush employed this kind of "end of days" rhetoric in his drive to privatise social security, an effort halted only by the protracted struggle in Iraq and Hurricane Katrina's devastation. Wolfe underscores the dark side of this appeal to populism, by arguing that it plays on majoritarian impulses. With respect to Iraq, the administration's rhetorical zeal�as when National Security Advisor Condoleezza Rice spoke in sepulchral terms about Hussein's "smoking gun" burgeoning into a "mushroom cloud"�cowed citizens and politicians who doubted the wisdom of a preemptive invasion. Most Americans, Wolfe argues, remain grievously misinformed about politics. Populist rhetoric taps the historic American tendency of distrusting government and exacerbates the problem. Wolfe is unsparing in his judgement of the electorate. "Americans," he writes, "have the choice to care about politics and have chosen not to. The failure to inform themselves allows their political leaders tremendous leeway to get what they want." The structural advantages of incumbency, the gerrymandering of districts�which, perversely, lets politicians elect voters rather than the other way around�and the decline of deliberative democracy (instead of the hard slog of negotiation and compromise, there are new rules requiring both a house and Republican majority in the House to enact laws), all point to an increasing lack of accountability by politicians. According to Wolfe, all of this is indicative of a fraying link between citizens and representatives. Meanwhile, disinterested institutions�the media, the judiciary, the scientific establishment�designed to stand above the fray of competing interests, are being battered by ideological currents. Deregulation by the Federal Communications Commission, the ability of nonmedia corporations to own media outlets, and the rise of cable television have transformed how news is reported. The corporate demand for market share, the mining of consumer preferences, entails a decline in time devoted to hard news. "Culture war politics," Wolfe writes, "provided nearly perfect grist for an industry seeking to find ways to make political debate more audience friendly to a citizenry not intent on grasping the complexities of public policy." The airwaves are no longer crowned with the staid authority of a Cronkite, but crackle with the stentorian bluster of a Bill O'Reilly. There is no denying the politicisation of the judiciary. The recent appointments of John Roberts as Chief Justice, and Sam Alito, have tilted an already conservative Supreme Court further to the right. The squalls of ideology haven't spared science either. In many schools of the Bible-belt, a core Bush constituency, equal time is being demanded for the promulgation of a pseudoscientific theory known as "intelligent design", alongside the theory of evolution. Draped in the robes of science, Thomistic theology is thus enjoined to counter Darwin. Republicans' mastery of the new politics, Wolfe argues, is threatening America's foundations as a liberal democracy. Democracy, in this capacious sense, entails that majority rule be undergirded by principles such as fairness and tolerance, a respect for pluralism, distrust of war, and the mobilisation of state power. Driven by ideology, homilists of the new politics�Limbaugh, Liddy, Coulter, and the like�evince suspicion of, and contempt for, pluralism. In practical terms, rules initiated by House Speaker Dennis Hastert shut the door on democratic input related to policymaking. Republican talk of fiscal restraint and limited government is belied by the Bush tax cuts, the benefits of which redound overwhelmingly to the wealthy. Meanwhile, the treasury's debt swells as the country finances its troops in Iraq, which is but one front on the war on terror, a war, Wolfe writes, that "will never end."